LARGE Baccarat Rectangular Cut Crystal Casket and Key. 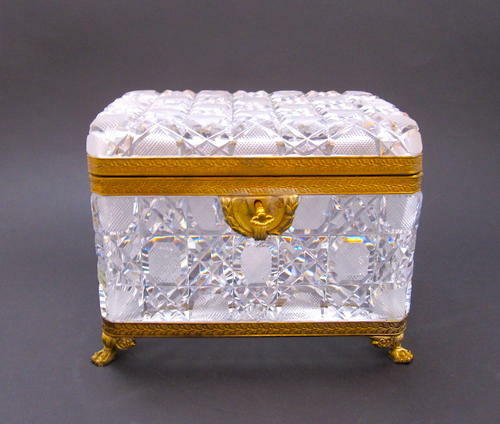 This Crystal Casket is Decorated with Different Geometrical Patterns including Octagonal Patterns and Cross Hatching. The Gilt Bronze Mounts are Craved in Great Detail with a Stylized Floral Frieze and the Lock with a Floral Swag. The Casket Rests on 4 Winged Feet. High Quality Baccarat Cut Crystal.